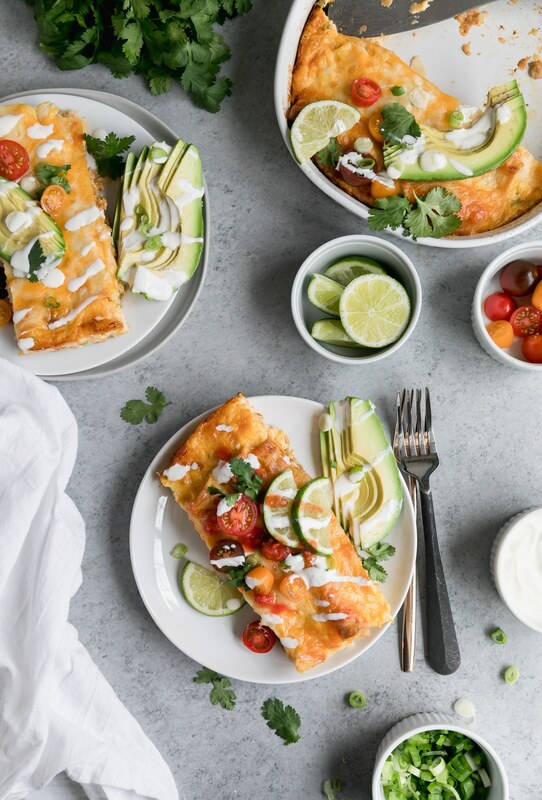 These Overnight Breakfast Enchiladas are the perfect make-ahead brunch! They’re filled with chicken sausage, peppers, onions, and spices, and then topped with an egg mixture, and left to sit in the fridge overnight! 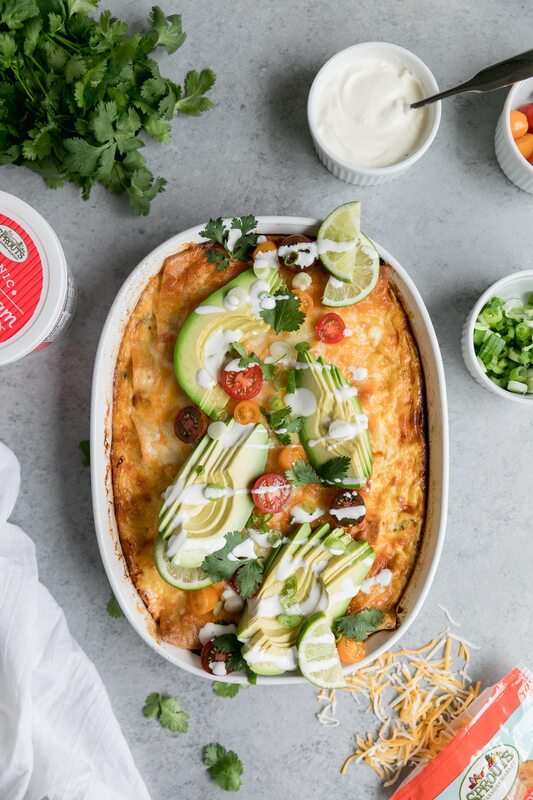 All you have to do is bake it in the morning, and serve with avocado, salsa, sour cream, and cilantro! I’ve always been a huge fan of overnight “breakfast bakes”, stratas, or any breakfast casserole for special occasions. I usually make them with leftover cubed bread, sausage, kale, fresh herbs, veggies, eggs, cream, and lots of cheese, of course. They’re so delicious and perfect for serving a crowd. 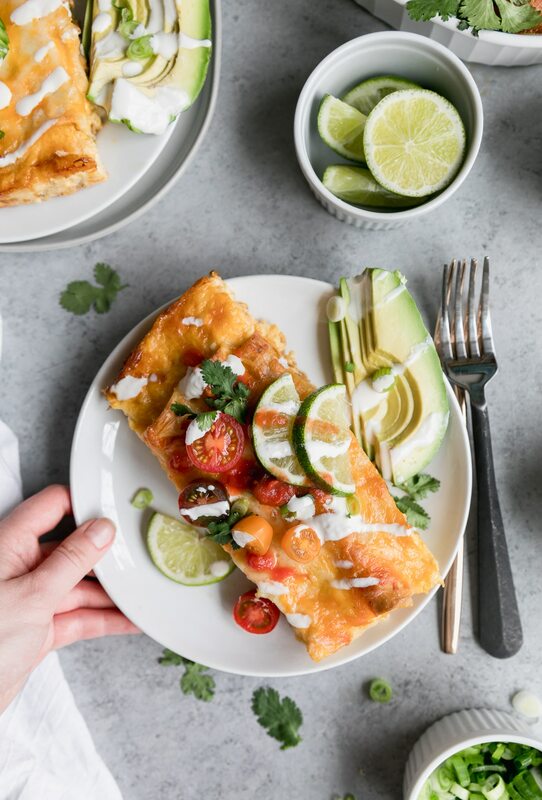 But you very well know my love for Mexican food runs deep, and same with my mom’s, so I decided to make an enchilada-inspired version for Mother’s Day! 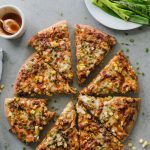 My favorite part of these might just be the toppings, as with just about every other food that I love. Toppings are just so much fun! 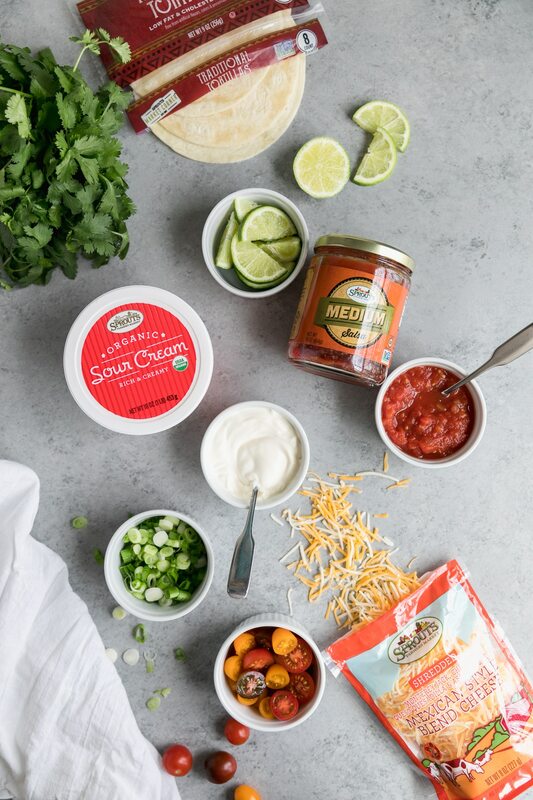 I love using sour cream and salsa especially to top these enchiladas, but you can go crazy with toppings here. I also added cilantro, scallions, avocado, cherry tomatoes, and lime wedges. 🙂 See? Go crazy. The more, the merrier. There’s no such thing as too many toppings, right? 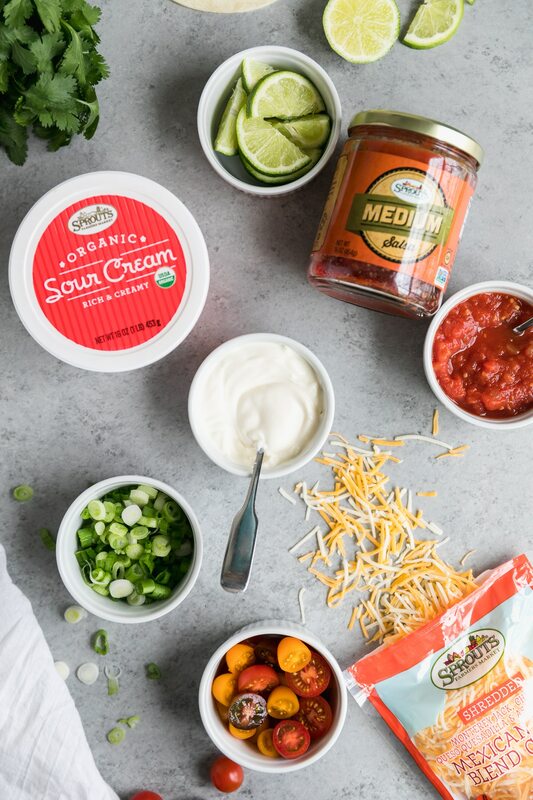 I absolutely love Sprouts sour cream and their medium jarred salsa, so those were a must. I also used their Mexican blend cheese and tortillas in this recipe, which are both fabulous. On Mother’s Day, I want to spend as much time as I possibly can with my mom, and not in the kitchen, so using the pre-shredded Mexican blend was a must here! And their tortillas are so soft and pliable, and they soak up the egg mixture beautifully and practically melt in your mouth. 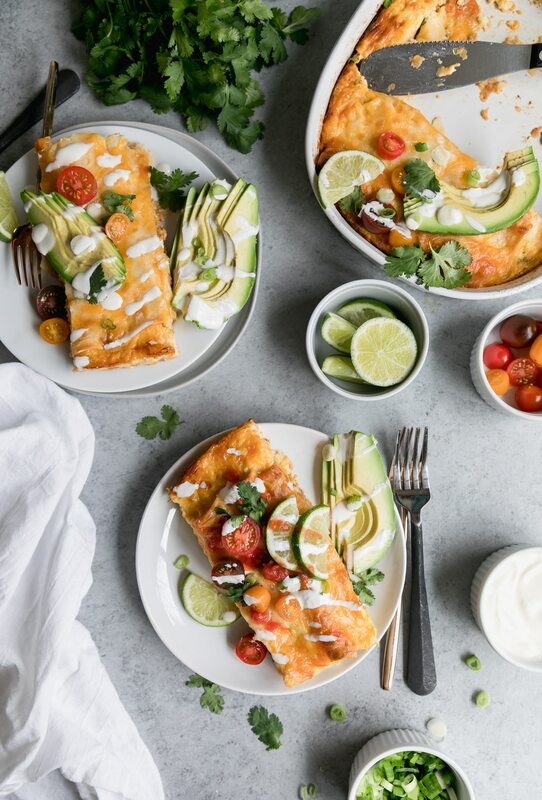 The other amazing thing about these enchiladas is that they’re completely make-ahead! 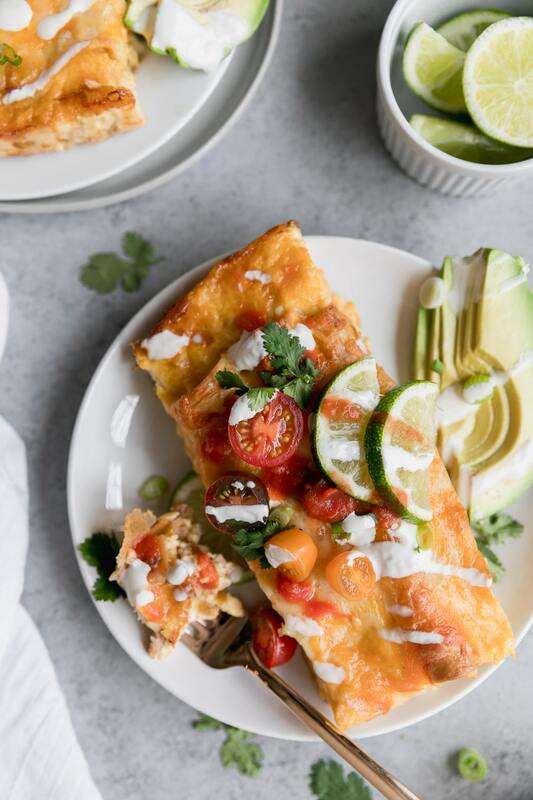 You just have to assemble everything, pour the egg mixture over you enchiladas, and let them sit in the fridge overnight! Then, all you have to do is bake it in the morning. Seriously could not be simpler. Also: definitely don’t skip the overnight step. The tortillas have to soak up the egg mixture and all the flavors kind of come together as it sits. I used a chicken breakfast sausage from Sprouts that they make in-store and it’s amazing. I’d highly recommend looking for that, but they also have other blends of sausages that I bet would be amazing here. Like chorizo! Really, you can’t go wrong here. It’s the most foolproof recipe, and delicious combo of flavors. It also makes a ton so it’s perfect for feeding your Mother’s Day brunch crowd. I also found that it re-heats really well too! But seriously, making a meal for anyone, especially for your mom on Mother’s Day, is one of the most loving gestures (in my opinion) that you can show someone. It’s always been the way I show others I appreciate them, and it’s so much fun to share an experience over really great food. So you should absolutely make these for someone special this weekend. With mimosas of course, and maybe some palomas or margaritas too! 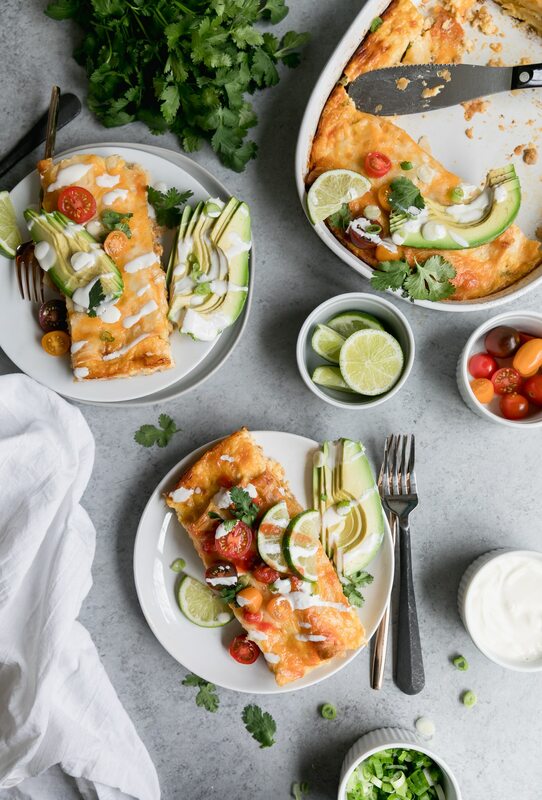 These Overnight Breakfast Enchiladas are the perfect make-ahead brunch! They're filled with chicken sausage, peppers, onions, and spices, and then topped with an egg mixture, and left to sit in the fridge overnight! 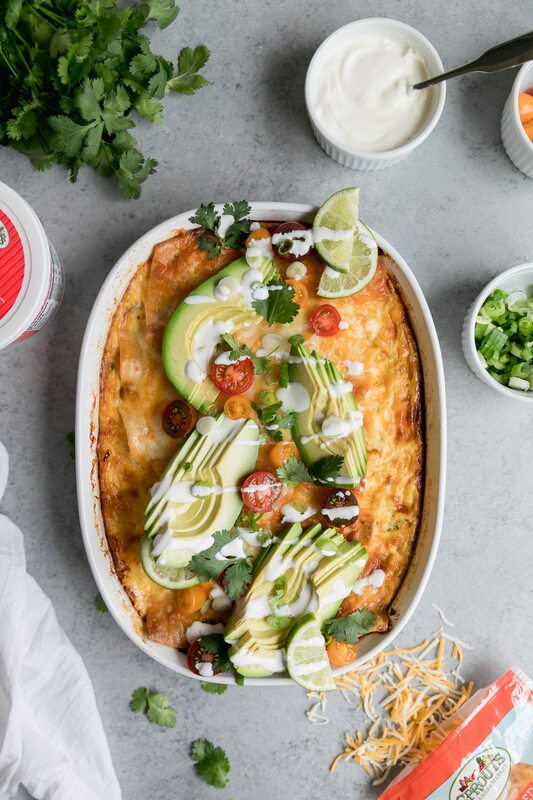 All you have to do is bake it in the morning, and serve with avocado, salsa, sour cream, and cilantro! Heat the olive oil in a large skillet over medium-high heat. Add the bell pepper, onion, garlic, cumin, chili powder, garlic powder, onion powder, salt, and smoked paprika and cook for 3-4 minutes or until softened. Add the sausage and cook for another 5-6 minutes or until cooked through, breaking the sausage up into small pieces with your spatula and stirring frequently. Once fully cooked, stir in 1 1/2 cups of cheese. Spray a 9x13 rectangle dish with cooking spray. Spoon about 1/4 cup (or slightly more) of the sausage filling onto one side of the tortilla, and roll tightly. Place seam side down in the pan and repeat with all 8 tortillas. Sprinkle any extra sausage mixture in the edges of the pan. Add eggs to a medium mixing bowl and add the half and half. Whisk until completely combined and smooth. Pour over the enchiladas and sprinkle evenly with the remaining 2 cups of shredded cheese. Cover with foil and refrigerate overnight (at least 8 hours). Once enchiladas have chilled overnight, preheat the oven to 350℉. Bake for 30 minutes covered, and then remove foil and bake for an additional 45 minutes or until the center is set, cheese is golden, and the eggs are no longer jiggly. If enchiladas are getting too brown toward the end of cooking, tent with the foil to prevent over-browning. 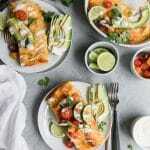 Serve with chopped cilantro, salsa, sour cream, sliced avocado, halved cherry tomatoes, and lime wedges. I wish you would have stated how many it would feed. ?? And stated whether you used flour or corn tortillas. Hi Lynne! The recipe yield states 4 generous servings. I used soft tortillas from Sprouts as the recipe states, and I find that flour work best! Let me know if you try it! Sounds yummy but wish it showed calories! Hi Sharon! Thanks for your comment. I don’t calculate calories for my recipes, but there are a bunch of free calculators online! how long would this last in the fridge? would it be ok to meal prep on monday and eat through the week?